interior excess cold (hernia, lumps, masses): yin cold traps yang qi within, can’t rise to the surface. 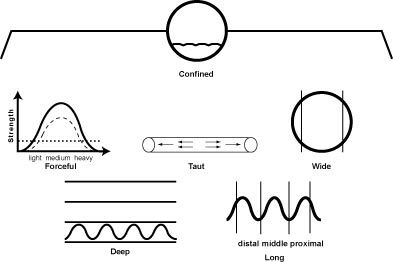 Explanation: this pulse is deeper than the submerged pulse but not as deep as the hidden pulse. There is only one cause for the confined pulse, and that is an excess type obstruction to the rising of the yang qi. In this case, as mentioned previously, yang’s arch rival “cold” has made its way to the interior where it may be generating palpable masses. Alism: this is the only pulse described as “stable”. I cannot claim to have knowingly felt this pulse. As such my working theory is described as an “alism”. I conceive of this “stable” quality as the sensation whereby the blood flow through the vessel never really drops down such as you’d feel with a normal pulse. The normal pulse has a period when the heart is contracting where you feel the wave of blood passing by. In between pulsations, the material within the vessel is less such that the pulse becomes smaller, thinner, etc. This is normal, this is what we’re feeling when we take the normal pulse. However, I believe that with the confined pulse, there is less difference between when the heart is pumping and when it is resting. The sensation of fullness in the vessel alters only a little bit with the “stable” confined pulse. Next: deeper than deep, it’s the hidden pulse.